Lou Reed’s Berlin is known as the most depressing album in rock ’n’ roll history. Indeed, Berlin was a full-force dive into the wild side. It’s a song cycle about a drug-doomed young couple that involves bad dope, domestic violence, crazy promiscuity, the Child Protective Services, and ultimately, suicide. And yet Berlin has held up amazingly well through the years. Harrowing lines like “somebody else would have broken both of her arms” and “Caroline says as she gets up from the floor/‘You can hit me all you want to/But I don’t love you anymore’” are no less politically incorrect now than they were 35 years ago, but the sad story of Caroline and Jim is an unflinching look at the dark impulses of love and obsession. In December 2006, Reed and film director Julian Schnabel (Basquiat, The Diving Bell and the Butterfly) recorded a concert film over a five-night stint in Brooklyn. 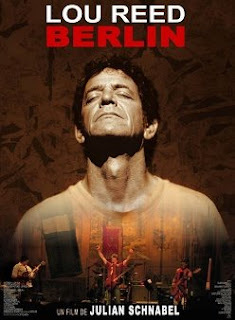 The DVD, called Lou Reed: Berlin, and the CD, titled Berlin: Live at St. Ann’s Warehouse, were released this month. The original Berlin band was basically a rock-royalty supergroup that included bassists Jack Bruce and Tony Levin, Steve Winwood on organ and harmonium, and drummer Aynsley Dunbar. There are some great players on the new version, too, including original Berlin guitarist Steve Hunter and two bassists, longtime sideman Fernando Saunders and Rob Wassermann. Reed’s backup chorus includes soul belter Sharon Jones and bizarro warbler Antony Hegarty. There are strings and horns and even the Brooklyn Youth Chorus. The emotional punch is still there. “Lady Day,” which Reed has kept in his live repertoire for years, still sounds potent, with Reed spitting out his description of the hotel Caroline called home. “It had greenish walls/A bathroom in the hall.” You’d thinking he was singing about hell’s most horrible pit. If anything, the new version of “Oh Jim” is even stronger than the original. Drummer Tony “Thunder” Smith lives up to his nickname in the song’s intro. There’s a tense guitar conversation between Reed and Hunter and a cool call-and-response with Reed and Jones. But the real core of Berlin has always been the final three songs. But fitting in best with the mood of Berlin is “Rock Minuet,” an overlooked tune from Reed’s 2000 album Ecstasy. It’s an eight-minute descent into sexual violence and murder — an acoustic number occasionally fortified by some truly monstrous electric-guitar solos. The new Berlin: come for the drugs and suicide, stay for the back-alley throat slashing.